Following the star the Fool travels through the night. The full Moon rises, illuminating for him a watery path. And he begins to feel disoriented, as if walking in his sleep. He passes under the moon, between two pillars ancient and strange. Suddenly, he looks around to find himself in another land entirely. When he was in the presence of the High Priestess, he saw hints of this dark land through the sheer veil draped behind her throne. And later, when he hung from the tree, he felt himself between the physical world and this one. Now, he has at last passed behind the veil. Here are the mysteries he sought, the darkest mysteries, ones that have to do with the most primal and ancient powers. It is a land poets, artists, musicians and madmen know well, a terrifying, alluring place, with very different rules. Wolves run wild across this land, hunting along side maidens with bow and arrows. Creatures from childhood nightmares and fantasies peer from shadows, eyes glowing. The path the Fool was walking is now a river, and he stands hip-deep in the powerful pull of its salty waters. There is, on the nearby shore, a small boat, but it has no rudder, no oar. The Fool realizes he has only two choices. He can lose himself in this desolate, primal land of madness and illusion, howl with the wolves, be hunted down, or he can get into the boat and trust himself to the river. The moon will be in control either way, but in the boat his surrender to the powers of the unconscious will at least take him somewhere. Inspiration, visions and genius are the rewards of such surrender to the Moon's Magic, as artists, poets and seers know. The Fool gets into the boat, and shoves off. As the waters sweep him away, moonbeams light his "path" and he feels the Mistress of this dark land gazing down at him with the High Priestess's approving eyes. With Pisces as its ruling sign, the Moon is all about visions and illusions, madness, genius and poetry. At its darkest this can be a very scary card warning the querent of hidden enemies, mental illness, alcoholic blackouts or a bad drug trip. 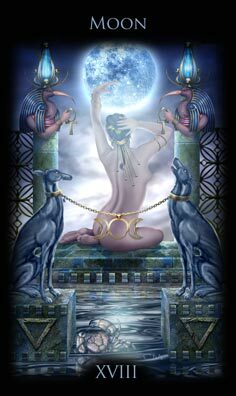 At its very best, however, the Moon is a card of genius, of mental breakthroughs, astonishing creativity, powerful magic, and intuition. The querent who gets this card should be warned that they may be going through a time of emotional and mental trial, a time when they'll do things that seem to make sense to them, yet when they come out of it they'll wonder, "Why did I do that? It makes no sense!" Their mind will be playing tricks on them, and so this is not a good time for making decisions that require rational thought and a clear head. This card can, likewise, signal a crazy time for relationships. Whirlwind romances, powerful and dreamlike, but not trustworthy. For families and friends this is a time of emotional ups and downs. If the querent has any past mental problems, they must be vigilant in taking their medication and seeing their therapist. They should avoid recreational drugs or alcohol, they will have a bad reaction if they take either. At the same time, the Moon signals great creativity, enhanced psychic powers, visions. The querent's judgment may not be trustworthy, but they will have intuitive flashes that are remarkably accurate. This is the card of that scary, dreamy, secret otherworld where lies the most powerful and dark magic and artistic talents. Thus, it is the card for the most extreme types who seem to be straddling that line between artistic genius and psychopath. Here are the wild, mean, crazy drunks who produce groundbreaking works with pen or paintbrush. Here are the musicians with wicked mood swings, dark, dark, dark depressions and charming manic modes. These men and women have no inhibitions and don't even try to control themselves in polite society. Their crazy behavior is sometimes inspired, sometimes horribly embarrassing, even unbelievable and often dangerous. But the art, poetry, music they produce....it's magic. This is also where seers, mediums and holy men/women find themselves after weeks of fasting, prayers and meditation, when they finally have that holy vision. Here is the magical forest in fairy tales, the wasteland in myths where heroes meet with spirits, oracles, sphinxes and their own shadow selves. There is no predicting what will happen when we go to this land in dreams or while hallucinating on mushrooms. And there is no predicting how it will change us. 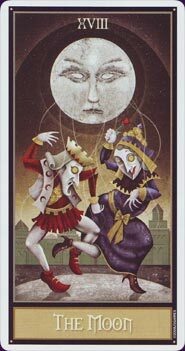 The Moon is the wild card of the Major Arcana. When I get this card, I let the querent know they're in for an emotional and mental rollercoaster ride. They're going to be moody, sensitive, and a little irrational. They can do two things, either wander through this crazy, lunatic landscape howling at the moon (get drunk, wallow in depression, alienate friends and family with wild, antisocial behavior), or get in a boat and go through it purposefully. Meaning that they should probably take up painting, writing poetry or some other creative endeavor where they can transform all they're seeing and feeling into something beautiful. Learn the Moon tarot card meaning and the rest of the card meanings, symbols and stories in our eBook.